If you are lucky enough to have access to fresh passion fruit, by all means use it, pulp and all. You may have best luck finding it in Asian or Latin American markets. But, I made due with juice concentrate and it worked great. You can find pure passion fruit juice at some co-op freezers or from Perfect Puree on the web. The shipping is expensive, because they pack it in dry ice and ship it overnight, but for a worthy occasion you may want to splurge. 1 cup passion fruit puree, fresh or Passion Fruit Concentrate (Use pure unsweetened passion fruit juice) – if you order it on the web, it is good to know that the shipping goes WAY down if you order 3 or more bottles. Freeze a 8 1/2 x 4 1/2-inch loaf pan and a serving platter. 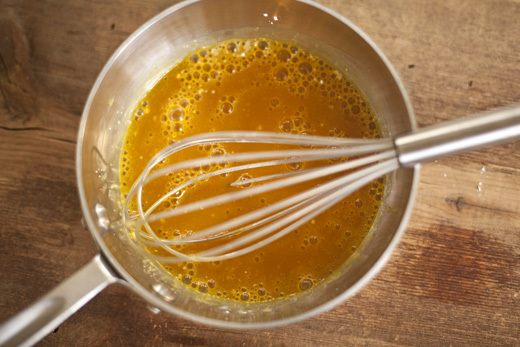 In a medium saucepan, whisk together the passion fruit juice and cornstarch. 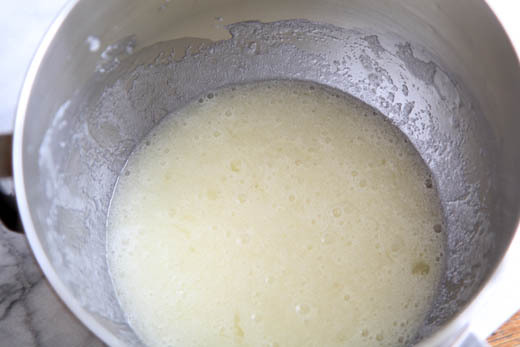 Bring to a rolling boil over medium-high heat and whisk continuously. You want to continue cooking it for about 1 minute after it starts to boil to cook out the starch. It will be slightly thickened. Reduce the heat and add the sugar, half and half, cream and salt. It will thicken slightly due to the acid in the juice. Cook slowly just until it starts to bubble on the edges of the pan, but don’t bring it back to a boil. 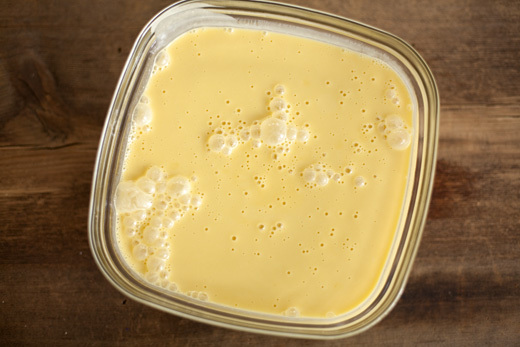 Pour the ice cream base into a shallow dish, cover and refrigerate until well chilled, about 3 hours. This can be done a day ahead. 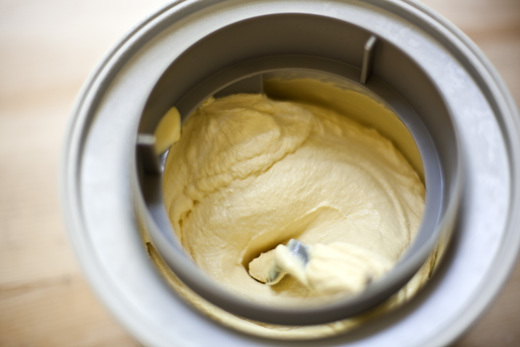 Freeze the ice cream according to your Ice Cream Maker instructions. 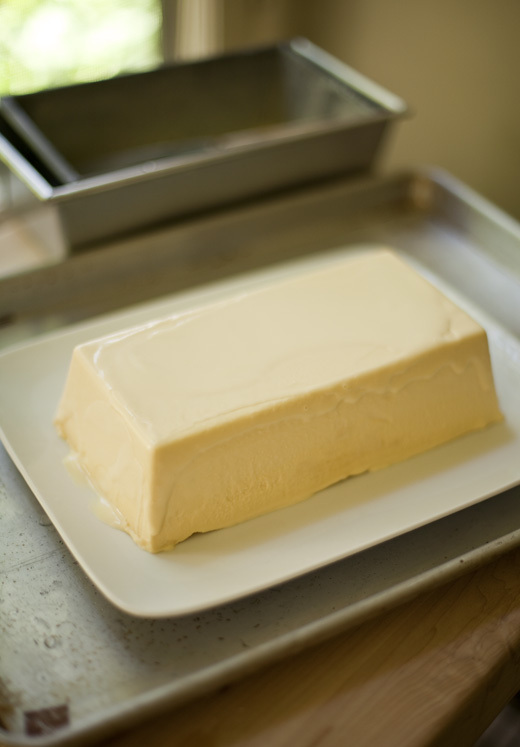 Empty the ice cream into the frozen loaf pan. 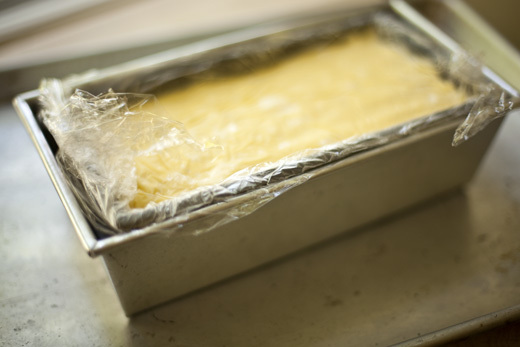 Smooth the top, cover with plastic and return it to the freezer until well chilled, about 5 hours or overnight. When the ice cream is well set, it is time to unmold it onto the frozen serving platter. 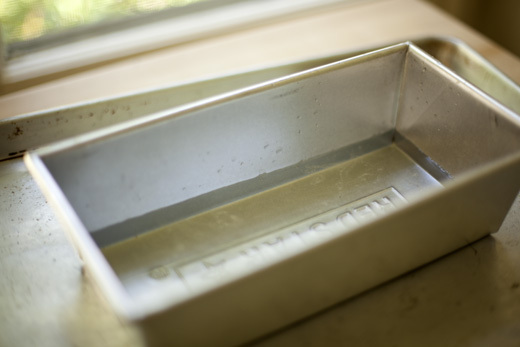 Fill a 9 x5-inch loaf pan with 1/2 inch of hot water. 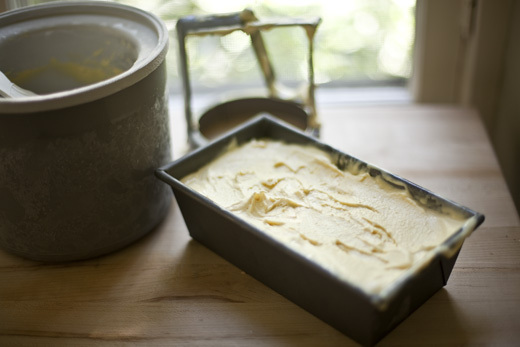 Lower the loaf pan filled with ice cream into the hot water for just a few seconds. Unmold it onto the frozen platter. If it doesn’t slip out easily, just run a butter knife around the edge and try again. Freeze the ice cream while you make the meringue. 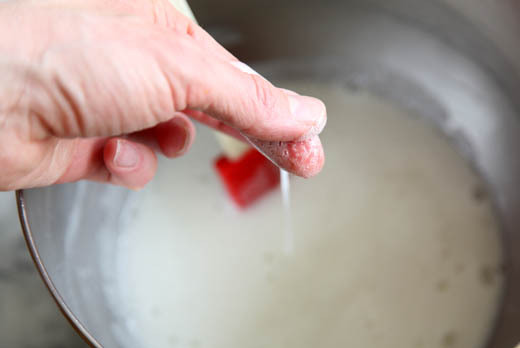 Whisk together the egg whites, sugar and salt in the bowl of your stand mixer. Rest the bowl over a pot of simmering water to form a double boiler. Scrape down the sides of the bowl so that all the sugar is off the sides of the bowl. Continue to stir the mixture until all the sugar is melted into the eggs and you no longer feel any graininess when rubbed between your fingers, about 3-5 minutes. 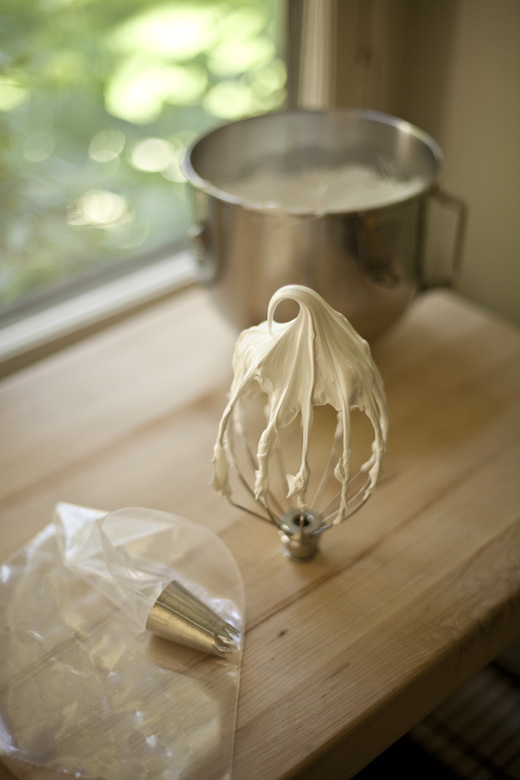 Place the bowl onto your mixer, add the vanilla, whisk on high speed until the meringue is thick and glossy and the bowl is room temperature, about 8 minutes. Be sure it is cool or it will melt the ice cream when you pipe it. 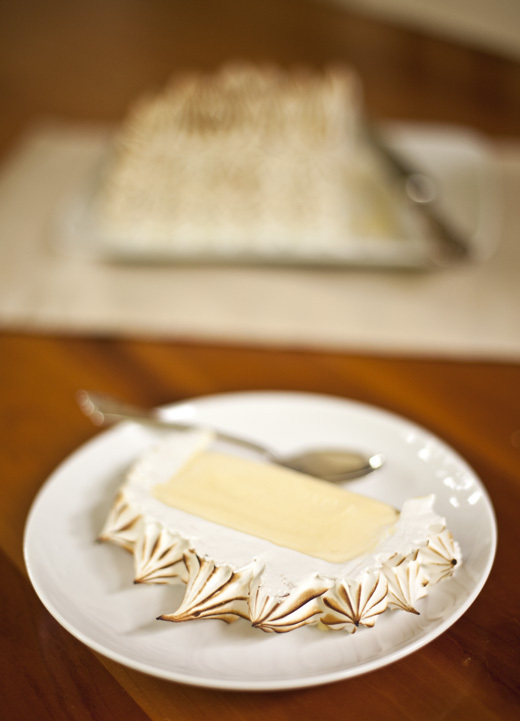 Using a pastry bag fitted with a large star Pastry Tip or a spatula, cover the ice cream completely with the meringue. 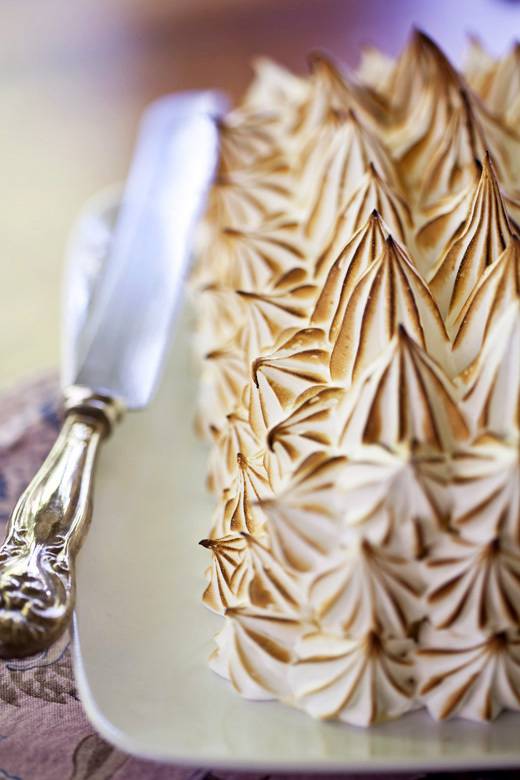 Use a Blow Torch to toast the meringue. 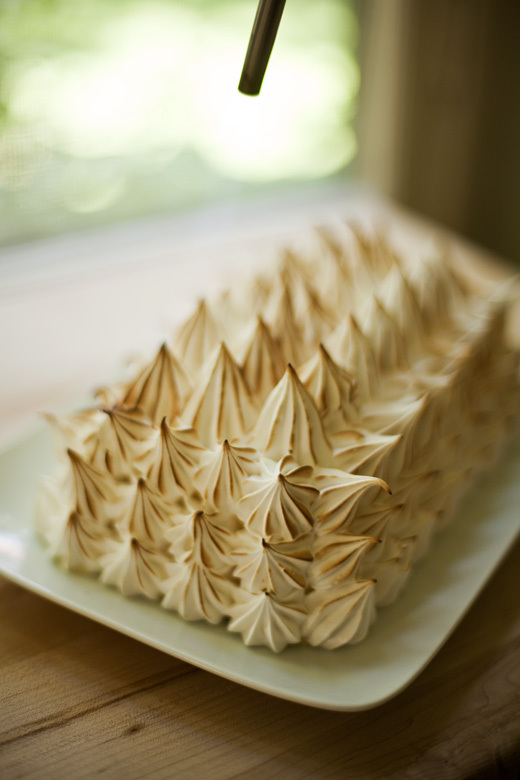 You can refreeze the baked Alaska at any point if it feels like it is starting to melt. 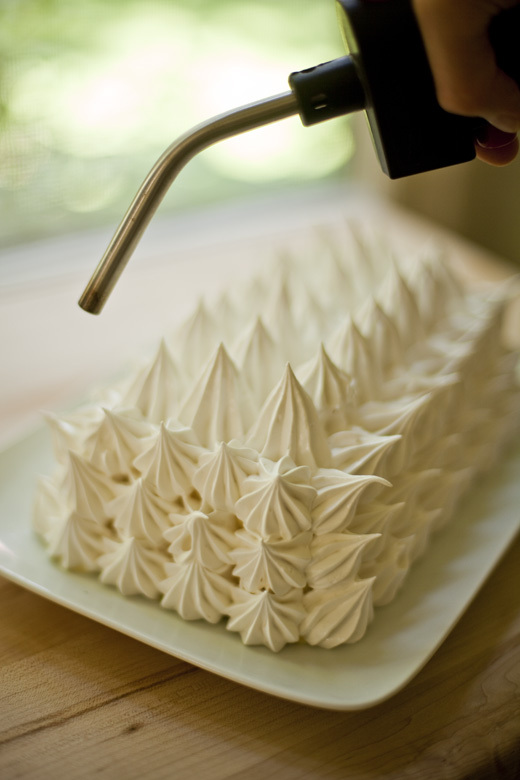 Toast the meringue and serve or place back in the freezer for later. 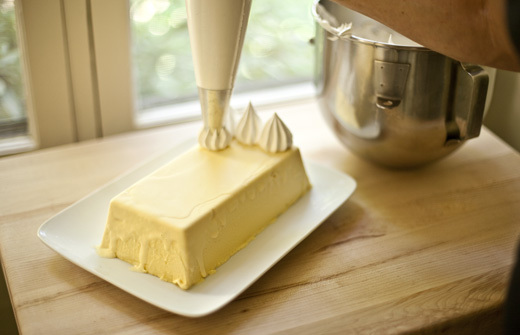 Use a knife dipped into hot water to cut the ice cream. This is so gorgeous, and I love the flavors!! This is so beautiful. 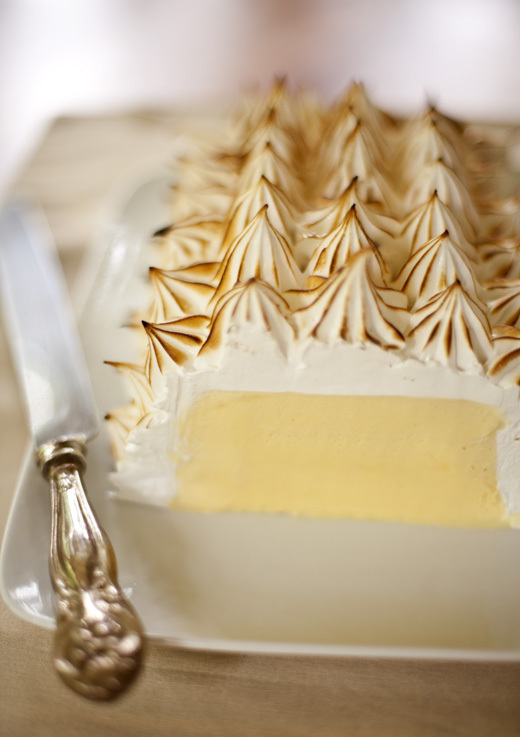 I’ve never made baked Alaska but now I want to. Thanks for sharing your step by step photos. Loved it. This is Fabulous!!!! And looks so so so beautiful. The photographs are awesome. And immensely helpful in getting how exactly to follow your recipe. I’ve never tried these delicious dessert but it looks amazing! Perfect images. Great job. What a drop dead gorgeous dessert! I’m going to have to make this one. Thanks for sharing! This looks just perfect, wow, I am speechless and I want to try this! Wow! That looks so elegant! This is so beautiful! What a showstopper! Wow, this is so beautiful and now I’m craving it!! This is so beautiful! Just the passion fruit is cream by itself sounds great. I made this over the weekend, and it was absolutely delicious! So simple to make and very tasty! What do you suggest if I do not have an ice-cream maker? You can try making it as a semifreddo, which I am going to be posting about soon. There are recipes for no churn ice creams, but I haven’t tried it with this recipe. If I want to put the baked alaska back into the freezer after I’ve browned the meringue, how long can I leave it in the freezer and do I need to cover it with something or can I just put it into the freezer uncovered? oops… forgot to check the follow-up comment box. sorry i made you open up an extra email for naught. Homemade Jam, Jelly and Preserves! Photo Shoot for a New Book!